The Basil Como Bicycle Basket is a modern choice of bike storage, with fixed mounting and a sturdy design making it an incredibly practical choice. Suitable for both men and women’s bicycles, this practical basket comes in classic black for easy coordinating with any style of frame and fits almost any bike. The Como is made of fine-grained steel for hardiness and durability, with a rectangular shape providing extra stability and a generous internal capacity for storing large format items and accessories. The perfect place to store groceries en route home from the store, or tucking away your backpack or satchel if you’re heading back from the office or study room. Heading to the gym? The Como is a great place to stow your workout essentials without having to worry about wearing an extra bag on your back. 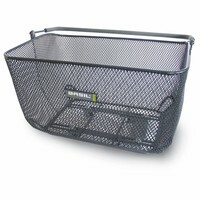 This basket can be fitted against the width of your luggage carrier using a BASCO clamp system, with the system suitable for carrier tubes with a diameter of up to 1.6 cm. This basket features sloped sides for an easier fit and to ensure less contact when cycling, making it ideal for those who regularly cycle and need to consider performance and comfort. Looking for more incredible bike baskets? On the hunt for cycling essentials to make every ride a pleasure? Browse all collections from Basil today and take your pick from an amazing range of must-have items and accessories. - Designed for attachment to your rear luggage carrier. 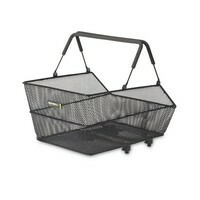 - Fits against the width of your luggage carrier. - Designed to fit most types of bikes. - Practical storage essential with endless applications.